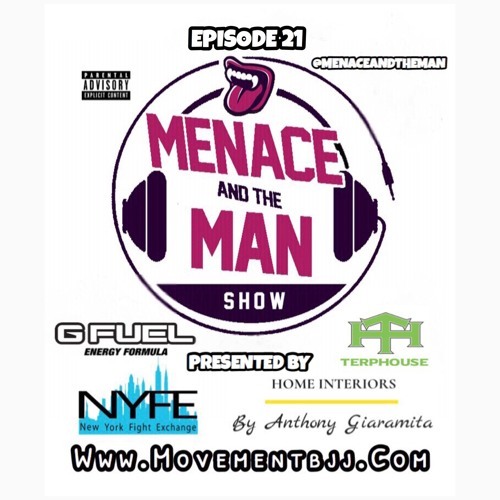 Menace and The Man Show Episode 21. This week Menace and The Man catch up with women's MMA trailblazer UFC straw weight Liz Carmouche, The Greatest Mustache in MMA UFC light heavyweight Pat Cummins and then we call UFC middleweight Champion Robert Whittaker in Australia. About 2:30 Liz Carmouche calls into the show. She is a pioneer and trailblazer for women's MMA. We talk to her about being a part of the first female fight in UFC history vs Ronda Rousey, how she was the first openly gay UFC athlete, being the first UFC fight in New York, her upcoming all women's Quintet match, her 10th planet gyms, her dieting habits to stay jacked, how she met her wife, whats next for her and much more. Around 51:30 we call up The best Mustache in MMA, Mustache and The Man co-host Pat Cummins. We talk to Pat about being in Vegas training, his recent booking for May in Rochester vs Ed Herman, we get some funny Menace and Pat stories, we talk to him about the upcoming NCAA wrestling national championships, how good Penn State is now and much more. Around 1:26:00 we call up UFC middleweight Champion Robert Whittaker. We talk to Rob about recovery from his recent injuries that pulled him out of UFC 234, we get deep into it with him about video games, growing up in Australia, playing rugby, we talk about family life, his thoughts on Kelvin Gastelum vs Israel Adesanya, when we can expect to see him back, fighting with his brother growing up, getting speared into a briar patch as a teenager and much more. Hope you enjoy!